Chennai: All-round Chennai Super Kings made short work of Kolkata Knight Riders (KKR), thrashing them by seven wickets in a lopsided Indian Premier League (IPL) encounter here on Tuesday. The victory saw the defending champions replace KKR at the top of the eight-team points table with 10 points from six matches. 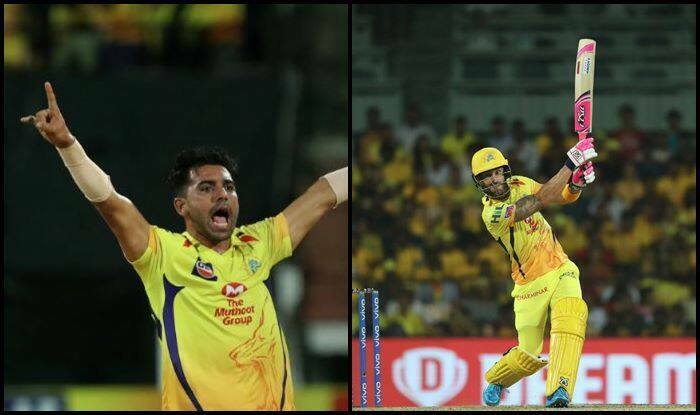 After the hosts lost Shane Watson (17) and Suresh Raina (14) inside the powerplay with Sunil Narine (2/24) taking both the wickets, du Plessis and Ambati Rayudu (21) stitched together a 46-run third wicket partnership, mostly scoring off singles. Once Rayudu was out, caught by Nitish Rana at short extra cover off Piyush Chawla, Kedar Jadhav (8 not out) joined hands with du Plessis to take the team over the line with 16 balls to spare. Earlier, Chahar shaved off the KKR top order early as Chennai never allowed the visitors to get an upper hand. Chennai even kept Russell quiet as the big-hitting West Indian hit five fours and three sixes but never got into the groove. KKR never really got going and it looked like they would not cross the 100-run mark before Russell — struggling with niggles — hit Scott Kuggeleijn for one six and two fours as the purple brigade managed to get 15 runs off the last over. Russell was dropped when he was batting on 8 by Harbhajan which was a difficult chance. KKR were reduced to 24/4 inside the first five overs, largely due to Chahar who bowled a superb first spell of 3-0-14-3. He first trapped Chris Lynn (0) in front to then account for the wicket of Rana (0) who hit a rising delivery straight to Ambati Rayudu at midwicket. The Rajasthan pacer then got the back of Robin Uthappa (11) who was guilty of trying to play one shot too many and holing out to Jadhav at deep square leg. Dinesh Karthik (19) and Shubman Gill (9) then tried to stem the rot but just when the pair looked to have settled in, Karthik hit straight to midwicket where Harbhajan took a sharp catch off Tahir. Tahir removed Gill too with a googly that slipped through between inside edge and leg for Dhoni to take the bails off behind the stumps. Russell and Chawla (8) joined hands for a 29-run stand for the seventh wicket but once Harbhajan sent the latter back with a delivery that spun sharply away from the batsman for Dhoni to effect an easy stumping, it was all downhill for the visitors.